I mentioned yesterday just how crazy our life feels these days. 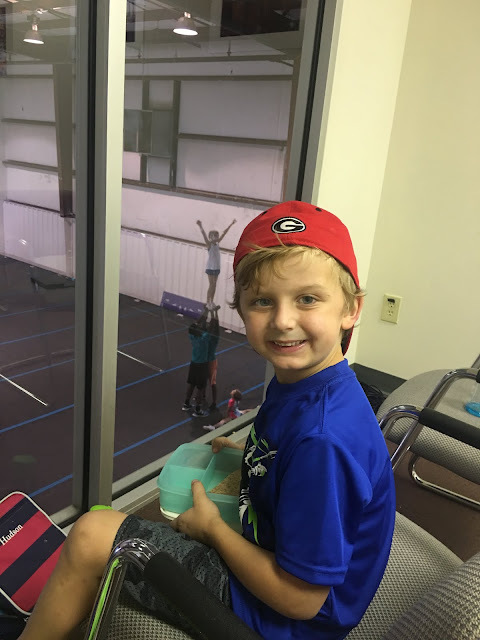 Afternoons are especially busy around here and although I have worked hard to find the balance between after school activities and time to just be a kid (read more about that here) with three kids each in a sport, that is just our life. 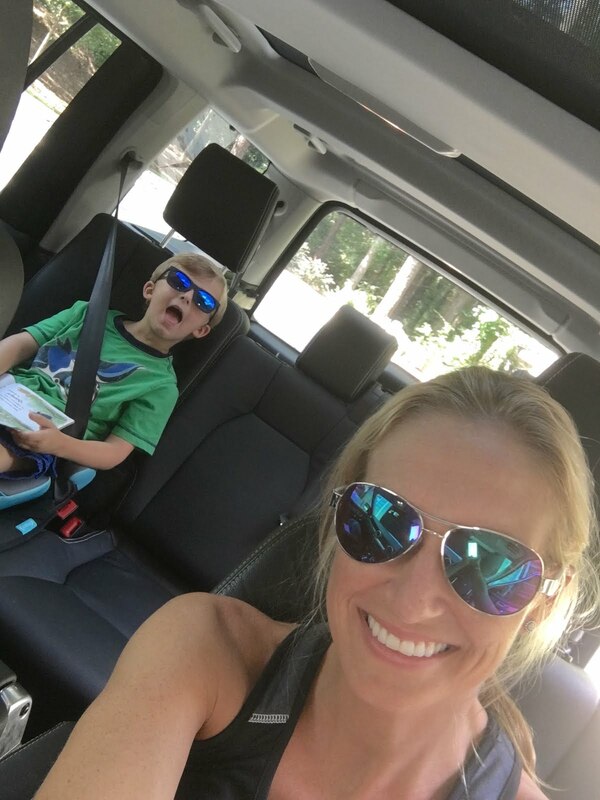 There are certainly days that I feel like I'm living out of my car in the afternoons, so I thought I'd share with y'all a few tips on how I survive the afternoons (and evenings) running from place to place. 1. If you need something done, do it before the kids get home from school. I don't know why it took me so long to figure this out, but once I did it helped me tremendously. I used to think I could get chores or little tasks done after they were home from school and the fact is that once they get home there is zero time for anything I need to get done. I want and need to focus on them. Between helping with home working, making sure everyone is getting changed and has all of their equipment, packing snacks (or dinners) and driving to all of the activities I don't have a chance to really do anything until after they are all in bed. At that point I'm usually exhausted so I've learned that I have to get it done earlier in the day while they are at school. 2. Be a homework police. I recently read an article about how homework in elementary school hasn't been proven to really assist in learning. It said that for many kids it creates a negative opinion of school and also creates negative relationships between students and their parents because the parents have to act as a homework police to make sure the kids get it done. 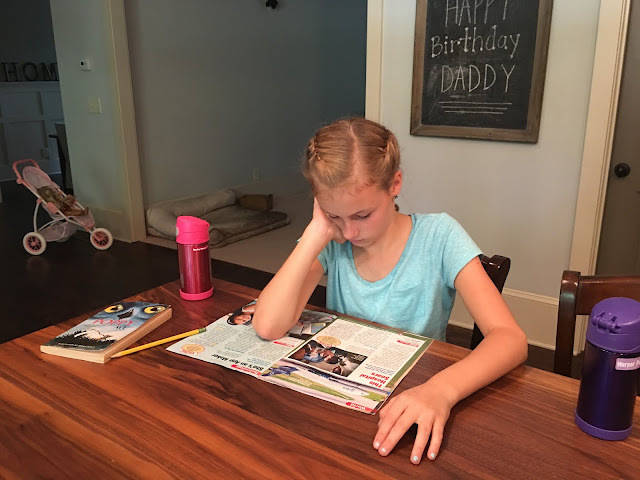 Well I am totally on team less-is-more when it comes to homework and would be happy if homework in elementary school was banned, but alas, that isn't the case and instead the girls have homework every night along with having to read and study for tests. So I have become the homework police. 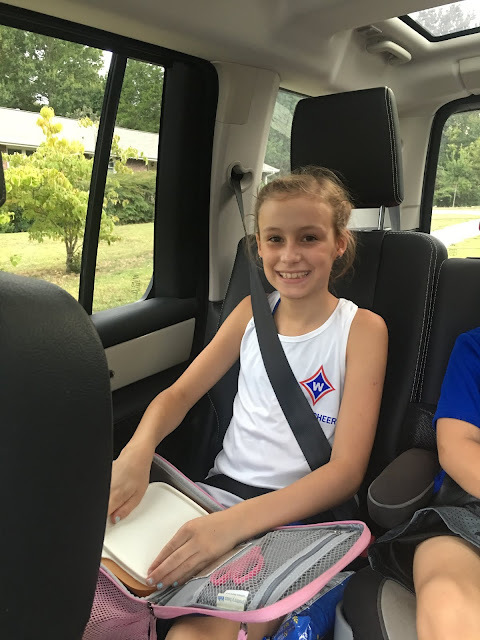 I know they have just spent 7 hours at school and the last thing they want to do is come home and do more work, but I always tell them that if they want to do these sports, they have a responsibility to get the homework done first. It is SO much easier to get it all out of the way right after school because if they wait to do it after we get home it's so much harder. They are tired, more frustrated with me trying to help them, and it takes twice as long. So my advice, be a nag. Make them get it done right away, so you don't have to worry about it later. Anyone that has kids knows that you never go anywhere without snacks, and I've started just packing a little bag with tons of extras or I'll pack them each a lunchbox with snacks and a meal on the go so that they stay fueled for the afternoon. It might be that we will grab dinner while we are out, it might be that they eat while someone else is in their activity or in the car while on the way from one thing to the next, or maybe we are going to eat when we get home. 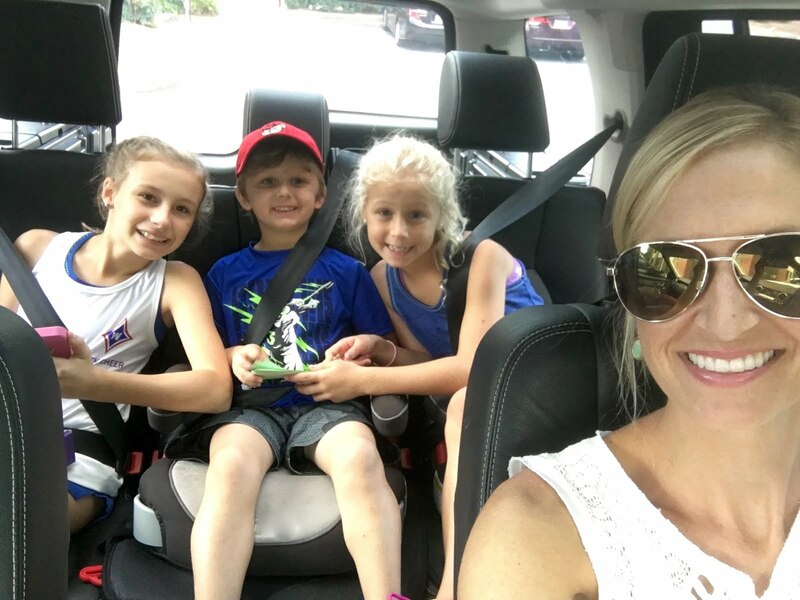 No matter what is happening for dinner that night, I know they are expending a lot of energy playing, running, flipping, or whatever it is they are doing so I want to be sure I have good, healthy snacks ready for them with us in the car. It seems simple, but staying organized in your car is key! I showed up to Boo-Boo's baseball game this week without his bag. No glove, no helmet, no bat, no nothing. Total mom fail! He was so disappointed and I couldn't believe I had done that. I had to run home and get it and I swore I wouldn't make that mistake again. Now his bag is going to live in the back of my car until the season is over. The girls are much better about knowing what they need to grab on their way out the door. They each have a backpack for their sport that contains everything they need. It is their responsibility to make sure it is packed and ready to go before we go. To stay organized I love using things like this cargo trunk organizer. I keep extra wipes, a towel for sitting on wet bleachers, umbrellas, Boo-Boo's backpack of toys for him to play with when we are waiting, etc. 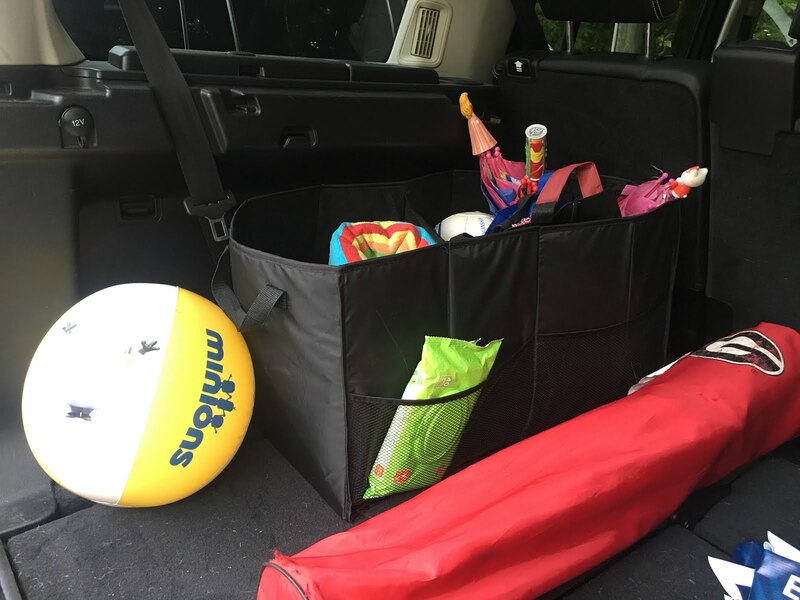 I also keep soccer and beach balls back there for the kids to play with and a tailgate chair because you just never know. 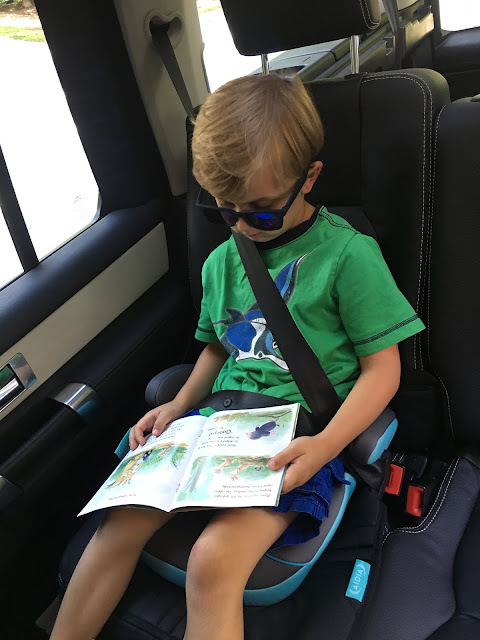 Some other things I keep in my car at all times...bug spray, lotion, sanitizer, extra hair rubber bands, tissues, napkins, everyone's sunglasses, and books for the kids to read. If you are going to be in the car going from one place to the next, you might as well make the most of your time. I started keeping Boo-Boo's sight word flashcards in the car so every time we have somewhere to go he can practice those. If Little Mama has a test to study for I have her bring that information in the car. 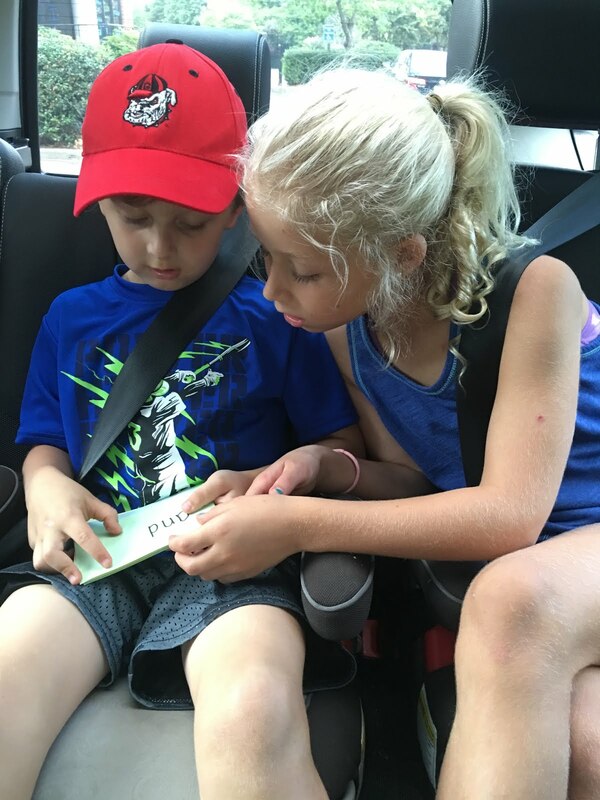 Sometimes doing homework in the car is hard, but something like studying and reading over notes is easier. Now don't get me wrong, they also have their fair share of iPad time, but I try to make sure we get the important stuff done first. 6. 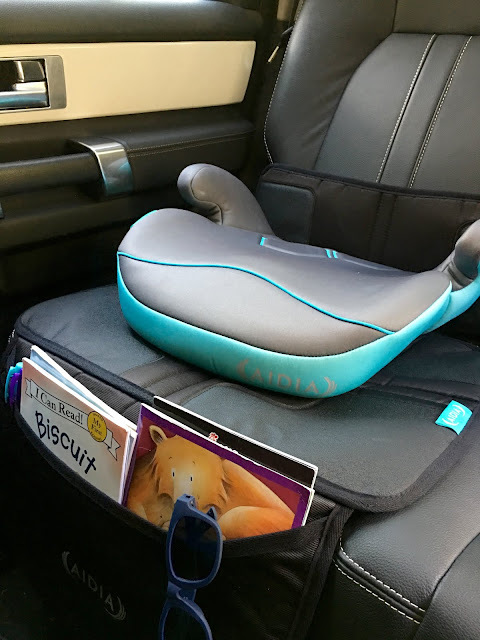 Easy in and out carseats. A month or so ago we were considering getting a new car for me. I love my car, but knew something a bit bigger might be easier with the kids and their friends that we sometimes carpool with. However, we ended up deciding to keep my car so I wanted to make it easier for carpooling and more accessible to get to the third row. In doing that I moved Boo-Boo to a backless booster instead of a high-back booster. He loves the Aidia scout backless booster. It's easy for him to get in and out of and easy to move around if we have friends with us and I need to do some rearranging of seats. I let him pick the color and obviously he went for the one with blue. In fact, Blondie loves that color of blue also and really wanted this seat when it arrived, so we've been doing a little bit of musical chairs here recently. When the girls aren't in the car he always snags this one for himself. Because I spend so much time in my car I want it to be clean. Of course dirt, crumbs, grass and everything else gets tracked in with all of the coming and going we do, but I'm not one to just let it go. I expect my kids to pick up after themselves and I love when my car is freshly vacuumed. To help keep it clean I do two things. First I keep a plastic grocery bag in my car at all times for trash. There is always snack trash the kids are handing me and with a bag I can easily keep it all contained in one place. When it starts to get full I just dump it and start over. So much better than trash all over the car. The other thing I do is use seat protectors in the back seat under the boosters. 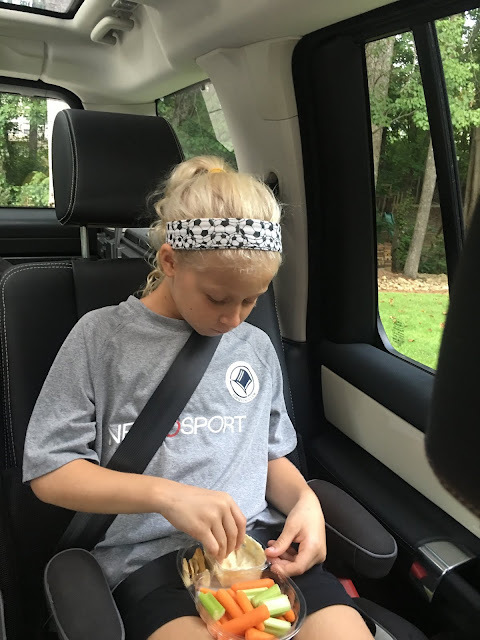 The Aidia EZpocket low-back seat projector is amazing because you know those snack crumbs like to find their way onto the seats and this helps protect the leather upholstery from snack messes. Also, those little pockets in the front are perfect for storing easy to reach books, snacks, flashcards and anything else that might help keep the kids entertained while in the car. One less thing for them to as me for! 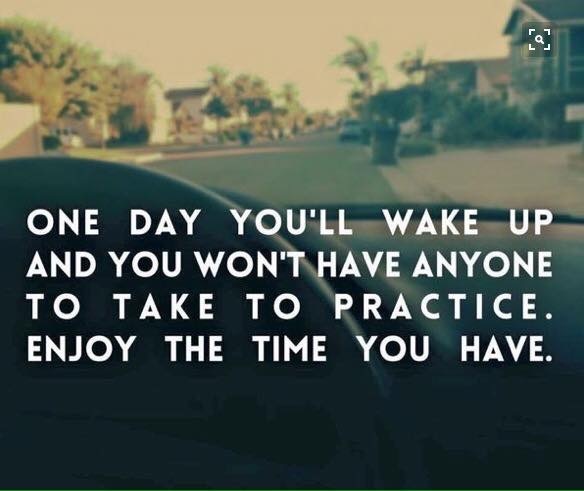 A friend of mine posted this graphic on Facebook a month or so ago and it really hit home. Yes, we are busy and yes there are days I just want to stay home, but I treasure the stage we are at. I love watching my kids do the sports they love. I know I will be longing for these years back one day so instead of wishing them away I'm just trying to make the most of it! 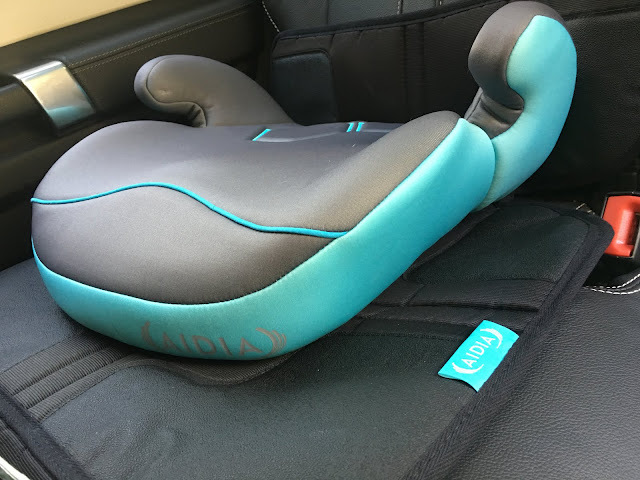 I was gifted the Aidia booster seat and seat protector in exchange for my review. All thoughts and options are my own.